The Hong Kong-listed conglomerate founded by gambling billionaire Stanley Ho has made its first foray into the Singapore property market - and it is certainly an attention grabber. 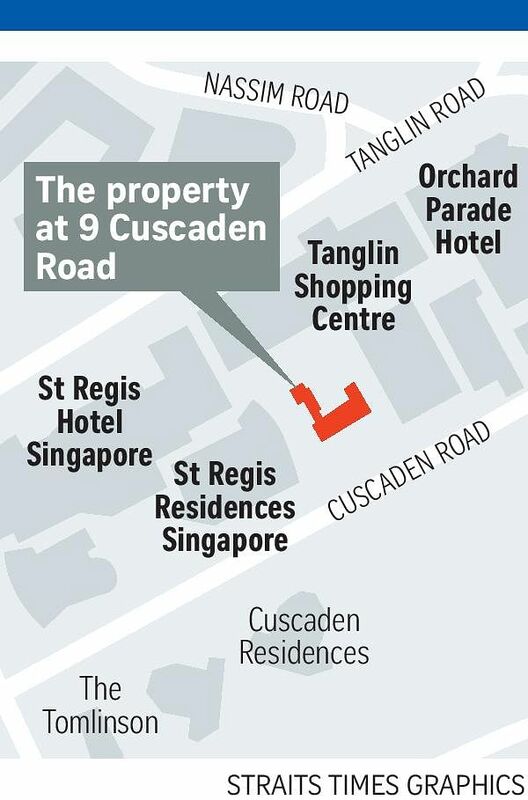 Shun Tak Holdings, via its wholly owned subsidiary Shun Tak Real Estate (Singapore), is paying $145 million for 9 Cuscaden Road, a bungalow put up for sale by the descendants of famed philanthropist Tan Tock Seng. It is the first hotel redevelopment site on sale in the Orchard area in more than 10 years. The sum is one of the highest ever paid for a landed house. It works out to about $2,145 per sq ft per plot ratio for a hotel redevelopment, including development charges. The 25,741 sq ft freehold site is zoned for hotel use with an allowable gross plot ratio of 4.2. It could also be used for residential development, subject to approval. Either building can be built to a height of 20 storeys. Shun Tak said it is at the preliminary planning stages and will announce more details later. "While the hotel zoning might deter potential bidders, it is a perfect fit for Shun Tak and would be a fresh injection of vibrancy into Orchard Road," said Mr Desmond Sim, CBRE research head for Singapore and South-east Asia. The site's zoning also means the purchase does not attract the Additional Buyer's Stamp Duty, unlike a residential site, he noted. The deal, brokered by JLL, comes nearly a decade after Mr Ho's aborted attempt to partner Genting International in building Resorts World Sentosa. Shun Tak is rooted in Macau's tourism business, with operations spanning hotels, entertainment attractions, travel consultancies, conventions and exhibitions, and transport. Ms Pansy Ho, Shun Tak's managing director and Mr Ho's daughter, said the firm would "apply our experience in serving the demands arising from the burgeoning China and Asian markets". She is also co-chairman and executive director of MGM China Holdings and is said to be Hong Kong's richest woman. The Cuscaden Road site was put up for sale last month with an asking price of $160 million to $170 million. It was the family home of the late businessman Tan Hoon Siang, who headed several rubber companies in Malaysia and was a great- grandson of Tan Tock Seng. The house is named Villa Marie, presumably in tribute to Mr Tan Hoon Siang's second wife Marie Windsor, who died in 2007. Property analysts believe it is too early to say if this deal and the Shunfu Ville collective sale announced last week are hints of a market upturn. CBRE's Mr Sim said investment activity is still relatively healthy but decisions are taking much longer, given the muted outlook.